Ben & Jerry’s has always been committed to an insanely ambitious three-part mission: making the world’s best ice cream, supporting progressive causes, and sharing the company’s success with all stakeholders: employees, suppliers, distributors, customers, cows, everybody. But it hasn’t been easy. This is the first book to tell the full, inside story of the inspiring rise, tragic mistakes, devastating fall, determined recovery, and ongoing renewal of one of the most iconic mission-driven companies in the world. No previous book has focused so intently on the challenges presented by staying true to that mission. 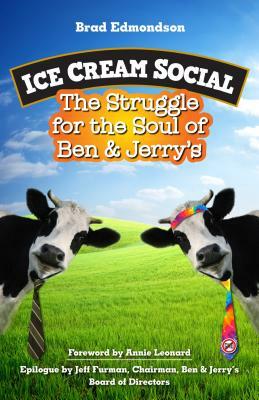 No other book has explained how the company came to be sold to corporate giant Unilever or how that relationship evolved to allow Ben & Jerry’s to pursue its mission on a much larger stage. Journalist Brad Edmondson tells the story with an eye for details, dramatic moments, and memorable characters. He interviewed dozens of key figures, particularly Jeff Furman, who helped Ben and Jerry write their first business plan in 1978 and became chairman of the board in 2010. It’s a funny, sad, surprising, and ultimately hopeful story. Brad Edmondson is an award-winning journalist and business consultant, the cofounder of ePodunk.com, and the former editor-in-chief of American Demographics magazine. He is a nationally recognized expert on consumer trends, advertising, and marketing, as well as a frequent keynote speaker at national conferences.